The development of the telescope, together with increased knowledge of things, brought men to see that the earth is not what man had once thought it to be. Do you have realistic expectations of what you want to see using a telescope? Be assured that you will not see images like the ones from astronomy magazines. Those pictures are taken using professional tools and more important, they are photographs using long exposures. Looking with your eye longer will not help you in seeing more light. To see what is the real image viewed through a telescope go to your local astro club or astronomical observatory. How much time can you dedicate to this new hobby? Do you have much spare time in the evenings or will commitments limit the amount of time you are able to spend observing? Astronomical equipment is often very heavy and bulky and if you only have an hour to spend, you don't want to waste most of it setting up the equipment. There is a well known adage which runs that "The best telescope, is the one you use most". Consider this before putting down your money on a large, equatorially mounted reflector which weighs more than you do. What type of astronomy are you interested in? Visual or astro-photography. For astrophotography you will need a telescope fitted with a tracking system to allow you long exposures. Beware that most beginners telescopes are not well suited for astrophotography. How much money you want to spend on the telescope? Just by browsing any astronomy magazin will make you realise that astronomy is not a cheap hobby. Look at the bright side: it's much cheaper today that it was few yars ago. If you have a very small budget your best option will be to buy a pair of binoculars. I know you can find very cheap telescopes in any supermarket or hobby store. They are not worth the money paid, and what is worst will leave with a big disapointment and probably you will never want to hear about astronomy again. What should you look for in a pair of binoculars? For binoculars or telescopes, the most important thing is light gathering. Usually binoculars are labelled magnification X diameter of the front lens (in mm). From the two caracteristics the most important is diameter of the front lens. The bigger it is the better. Do not buy one with a diameter smaller than 50mm. When you buy the binoculars make sure that they are fitted with a threded hole to unable you to use them with a tripod. You also need to consider buying a tripod and an adaptor to fix the binoculars on it. A good all round binocular for astronomy and also for daytime use is one labelled 7x50 or 10x50. Note that for astronomical use, some optical aberrations are very important to be minimized. Buy your binoculars from a good telescope dealer as they will have a better idea of which instruments will perform best for astronomy. Even on a modest budget it's still possible to purchase a telescope which will provide all the required functionality. It is just that selections must be made more carefully to avoid the usually very poor "department store junk scopes". What should you look for in a telescope? - Construction type - select the one to meet your needs. Beware of exaggerated claims for maximum magnification. The very best scopes will be limited to a magnification equal to approximately 50x per inch of aperture and in most practical observing conditions to more like 30x per inch. 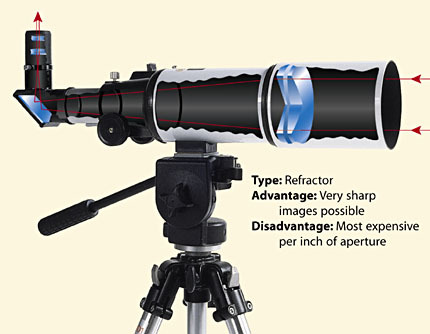 The 2.5" department store refractor is not therefore going to be useful at much above 100x magnification, let alone the 675x or more often claimed. For most uses a much lower magnification will be best anyway. Astronomical objects are not necessarily small, they are just far away and faint. For this reason, light collection is more important than magnification. This leads to another old adage, "Aperture wins". The largest practical sized telescope (remembering the rules about lifestyle) will almost always show you more than a smaller one. Unfortunately, as collection area grows, so does the weight of the scope and the mount required to hold it steady. The need for a sturdy mount cannot be overstated. It is what keeps the optics pointed where it should be and if it is too shaky the whole experience can become very unpleasant. Most beginners start with a refractor and this is not necessarily the best choice. 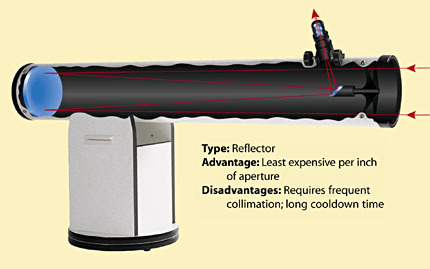 The reason is that the price per aperture is higher than for any other type of telescope. If price is an issue than a refractor is not the best choice. There are however a few good choices in this category. My first telescope was an Orion Short Tube telescope with an aperture of 90mm. I was very happy with the quality and performance and I will recommended for a beginner. Due to their small aperture usually they cannot show a lot of details for a deep sky object like a galaxy or nebulae. The main down side to refractors is that due to their expense, they are limited in aperture and will not show as bright an image of deep sky objects (galaxies, nebulae and star clusters etc) as a larger scope. Depending on how they are mounted they are classified in: Dobsonians (after its founder John Dobson) and equatorial mounted. Dobsonian must be moved by hand to follow the stars. The major advantage is the low price. The equatorial mounted use electric motors to tracking the stars. They allow you to see deep objects and also to attach a photographic camera. Disadvantages: expensive and heavy. Don't buy before you have seen one of these beasts. Regardless of mount, these telescopes are known as a Newtonian, after their inventor Isaac Newton. As a general comment, reflectors have the best price/aperture ratio. This is a very important class of instruments providing large aperture using a compact design making them very portable. 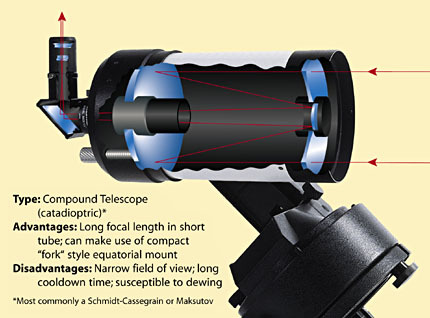 There are two very close categories: Schmidt Cassegrain (SCT) and Maksutov Cassegrain (MCT). An 8" SCT is a recommended intermediate to advanced level telescope, very suitable for visual observing and very well equipped for prime focus astrophotography. They are good all round performance for all types of observing. Do your homework and buy a telescope from a specialized in astronomy shop.